By scooping up our packages, drones might leave us with fewer jobs. France’s national postal service, Le Groupe La Poste, has begun a testing program to bring delivery by autonomous drone to the country. This announcement comes on the heels of Amazon successfully completing its first drone delivery over in the U.K.
A subsidiary of the postal service, DPDgroup, has been working on making drone delivery a reality in the European nation since 2014. The group partnered with French drone-making company Atechsys to provide the drones, which can fly up to 19 km (12 miles) at speeds of up to nearly 31 km/h (19 mph) while carrying a parcel weighing up to 3 kg (6.6 lbs). 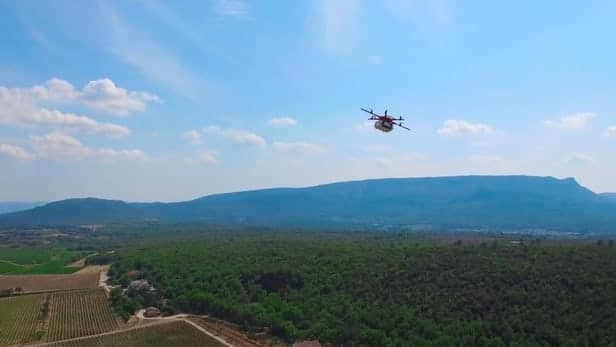 The drone test route covers about 15 km (9.3 miles), which is the distance between two depots in the southeast of the country, Saint-Maximin-La-Sainte-Beaume and Pourrières in the Provence region of France. The packages are dropped off and picked up from these designated depots. Any advancement in autonomous robotic technology always brings about a renewed debate surrounding jobs and unemployment. Experts say that robots will continue to replace humans, with some estimating that anywhere from 47 to 81 percent of jobs could be eliminated by technology. Low-skill jobs such as manufacturing are no longer the only kind being discussed as potentially on the chopping block. IBM’s Watson AI was just as effective at recommending cancer treatments as doctors, and not even editors are safe, as Watson was also able to edit an entire magazine on its own. It’s also said that AI can replace 80 percent of IT workers. Universal basic income is being discussed as a way to ease the blow that automation will take on the workforce, but even if that’s not the ultimate solution, something will need to be done soon to account for the loss of jobs due to technology. A $10 Million Investment Is Set to Determine If Universal Basic Income Would Work in the U.S.